Our client (the U.S. Marine Corps) wanted to quantify the effects of the infantry Marine’s loads (i.e. everything they wear and carry) on combat performance. As no comprehensive, valid, and reliable systems to assess soldier performance under load existed currently, we were tasked to build a system that would do just that. Marine Corps subject matter experts provided input in focus groups and interviews about critical combat tasks and key performance indicators. Workshops explored possible obstacle course elements and critical tasks; these were downselected in an iterative and systematic process. Eventually, obstacles were physically constructed, and subsequently verified and validated. 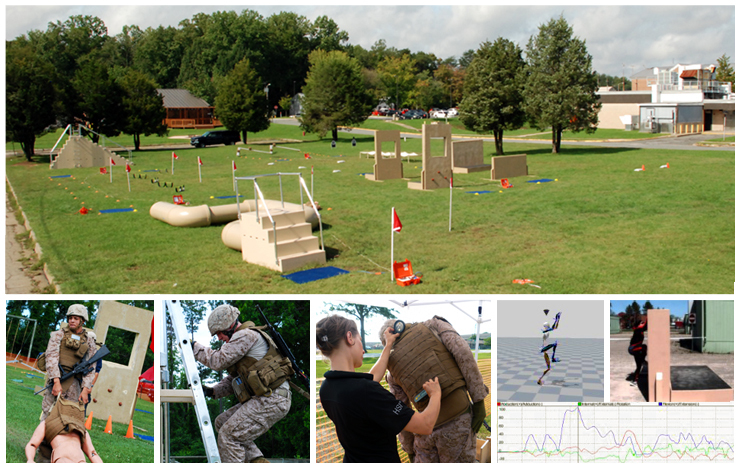 We designed a transportable instrumented obstacle course capable of systematically and scientifically determining the effects of worn and carried loads on Marine mobility and combat performance. This program was named the Marine Corps Load Effects Assessment Program (MC-LEAP). Whether in manufacturing or in firefighting, knowing how workers will perform under varying conditions is critical to protecting their safety and well-being. Our approach is transferable to any problem, ranging from exposure to heat or cold, repetitive tasks, or high stress environments.